Until I read the words, I had no idea. 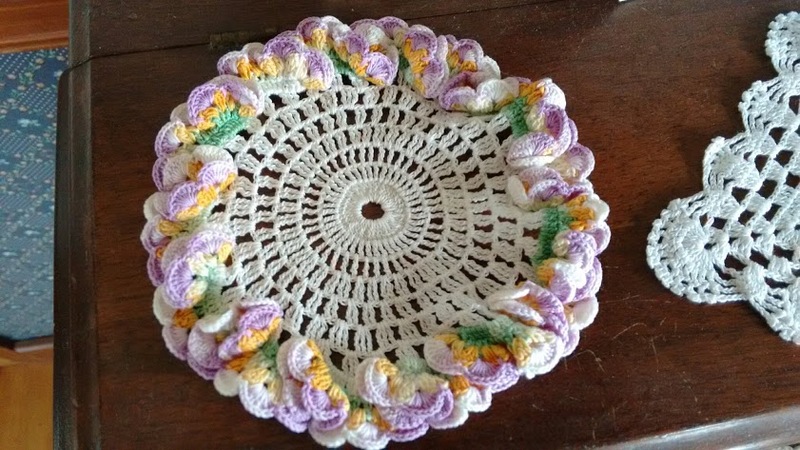 Who made this beautiful doily and where it came from was a mystery. I found it among many similar items in my mother’s attic. 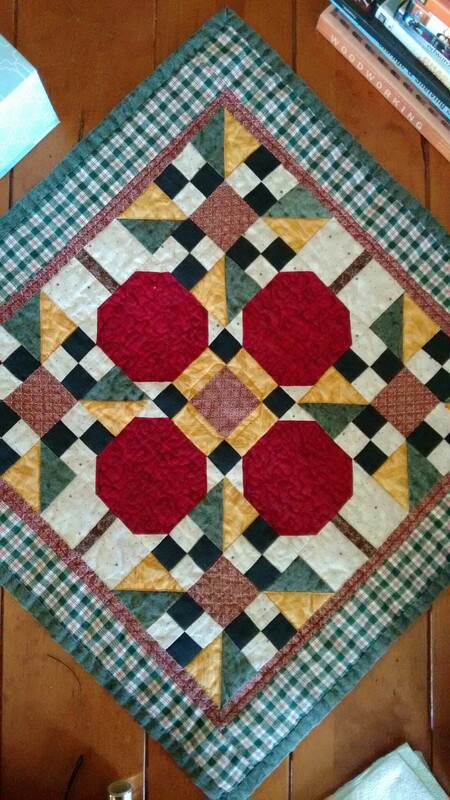 It was made by my great grandma Orah who, apparently, was quite crafty. 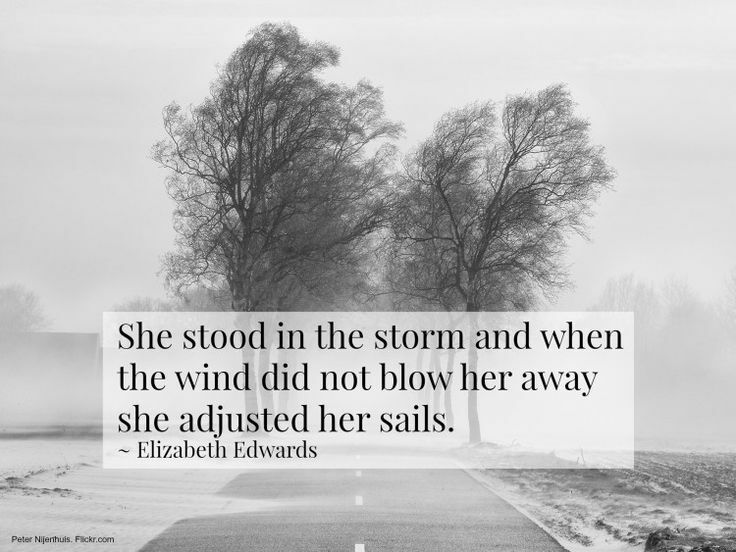 Given the era and level of family poverty, her efforts weren’t solely to kill time. As of this writing, the war had yet to end. 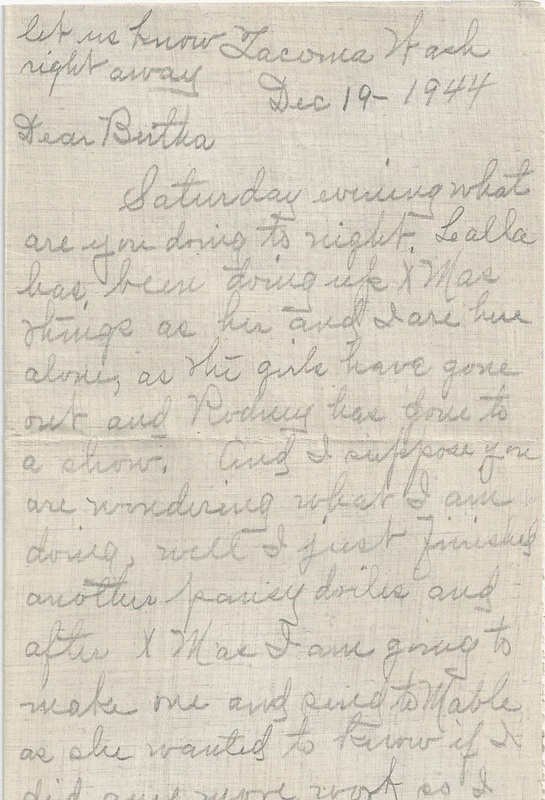 Orah and her daughters made what was needed: dresses, tablecloths, tea towels, aprons, and various crocheted items. What wasn’t used was sold, if possible. 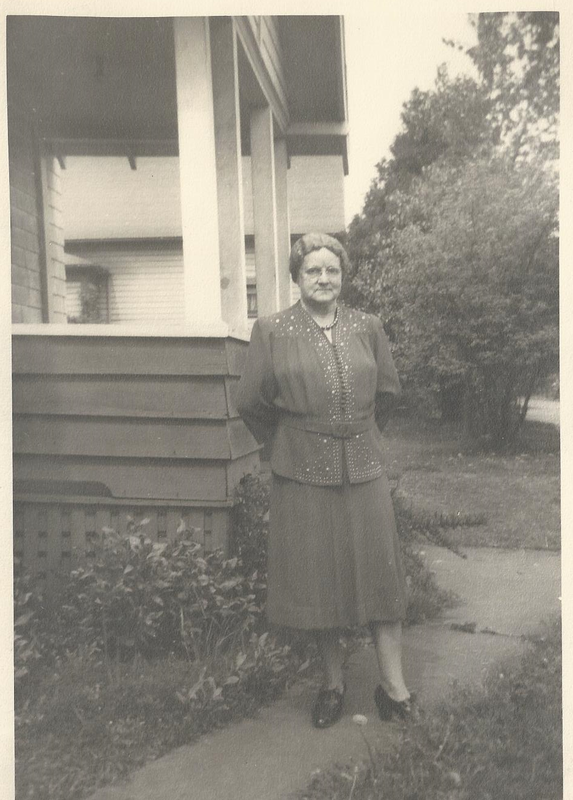 Patterns were ordered, thread and fabric were purchased at the local store, and crafting began evenings, after chores. 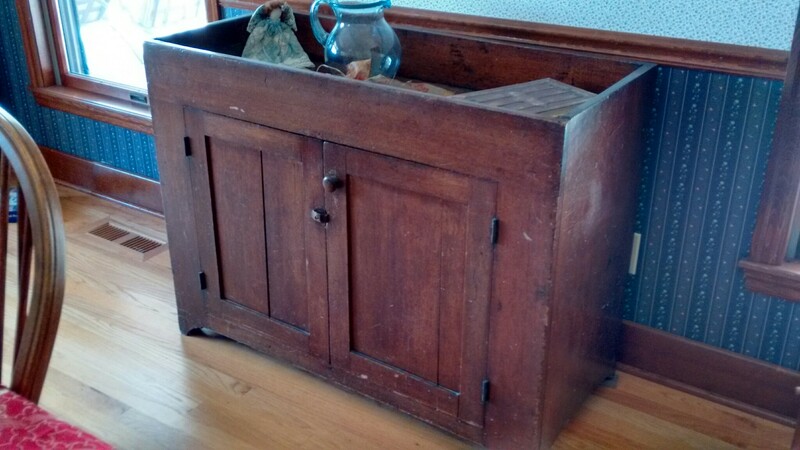 My mother-in-law, Dorothy, owned several pieces of furniture that can make your heart sing if you appreciate antiques. I keep many of ours in what I call the granny room, my favorite room. It holds pieces from both my grandmothers, as well as my husband’s mother Dorothy and her mother Lucy. My favorite pieces on my husband’s side are the high chair and dry sink. 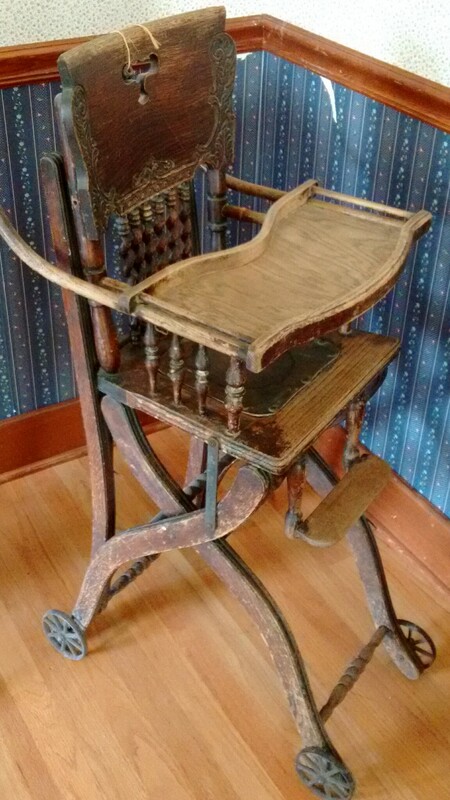 Dorothy sat in this chair when she was a baby. She was born in 1914. It’s the same high chair her older, half brother sat in when he was a baby. That makes this piece about 115 years old. 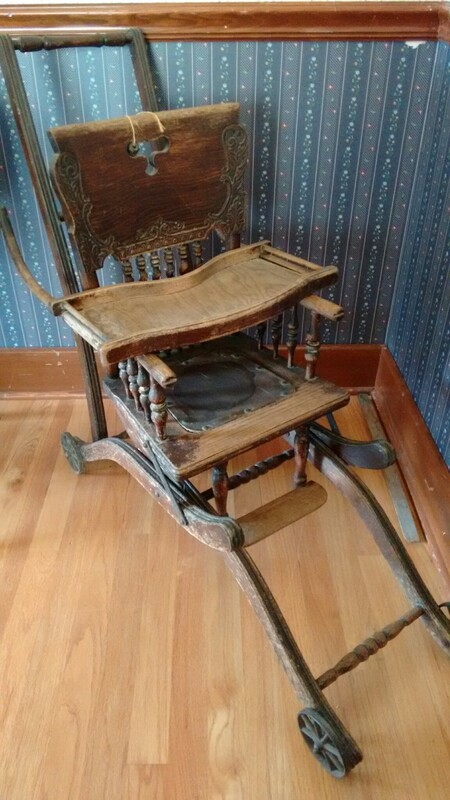 That oozes cool, but here’s the best part: not only is this a high chair, it’s also a stroller. Were they ever on top of the game. The dry sink originally sat on Lucy’s enclosed, back porch where Dorothy grew up in Miamisburg. We visited that house a few years ago. We were able to as it’s on the historic registry. It was a treat to accompany our three children inside the very house their great grandfather (Lucy’s husband) built, the same home where their grandmother Dorothy was born, the same house in which their father played when he was a child. The house deserves a post all its own. It’s coming, and will be worth the read. As for other antiques we have the pleasure to display in our home, these can’t go without mention. 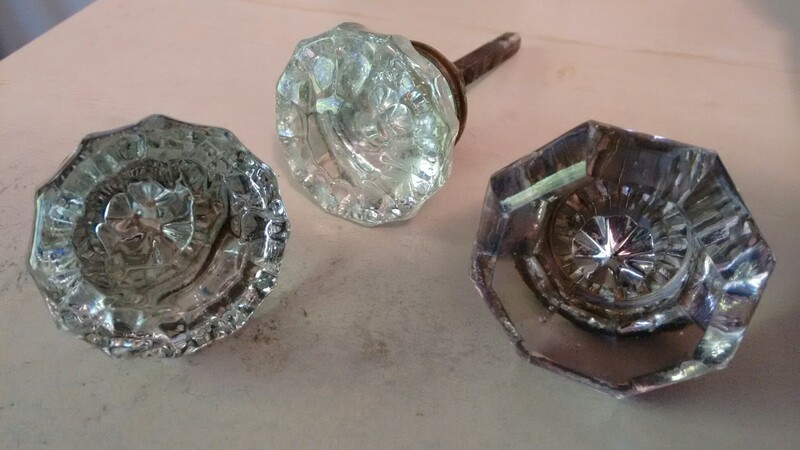 Until they were released from previous ownership–said thief shall remain nameless–these door knobs used to reside in the home where I was raised. I can’t say I am completely unhappy there is a thief among us (although therapy or jail time may one day be required). Not only do these door knobs generate many happy memories, but they are pretty and they make great paper weights. They make me smile. Bottom line? While I am a little nervous about that thief, the knobs rock. I’ve been very conflicted, though. Why do mere items or possessions elicit such strong feelings, why some more than others? This began last year during the process of moving mom and uncovering much of our history. I wondered what’s in the research, so I did a little digging. Specifically, I wanted to know why I was attached to a doily. I didn’t know Orah, and I certainly have struggled with my less-than-positive feelings about her behavior (even though she passed away seven years before I was born). How come that dry sink means so much? I knew Dorothy, but not her mother. How come the idea of parting with that high chair/stroller is unthinkable? Why do those door knobs, the ones from my childhood home, bring such joy? The stealing of, I mean, passing along of family heirlooms to the next generation, even items of little monetary value, has significant meaning. 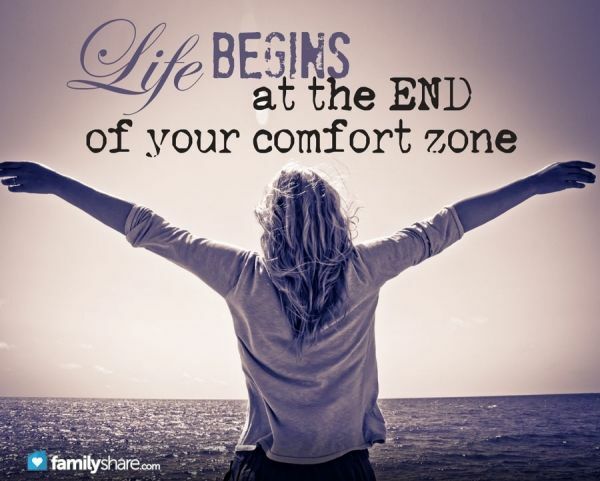 We define ourselves not only by our present, but our past and future. Possessions become an extension of self. In addition, they can act as a support system or ballast, an anchor to a familiar place, time, or circumstance. Maybe even a person. “A sense of past is essential to a sense of self” (1). For me, it’s about continuity, pure and simple. That I didn’t know Orah or Lucy does not matter; that I have issues with certain behaviors is irrelevant. I feel exactly the same about the doily as I did before I knew its creator. It’s gorgeous. It’s flawless. I cannot get over the effort it took to create such perfection. 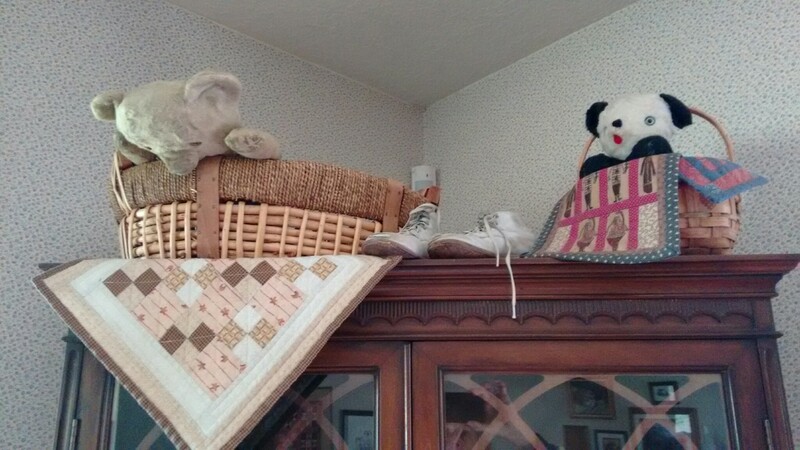 It provides a connection to her, never mind my struggle with behaviors; it matters because she made that doily. Is this the paradox, then, that someone with less than charitable behavior can create something so beautiful? Or, does my conflict originate elsewhere? I don’t think I’ve been squirming so much about Orah’s behaviors, actions, or perceptions; rather, it’s about coming to terms with mine. She and dad are long gone, but I have a choice. I can choose to see Orah in a negative light. Or, I can accept her, flaws and all, as I hope one day my children and theirs will accept me for mine. The imperfections and flaws make us human, which brings to a close another chapter in my book on Perspective. The class is Life Lessons, 101. A backward glance…..the place was South K street, the year 1944. I try to imagine the house, Orah’s daily life, and how she felt (based on her letters). That’s Orah at the K street house where she lived with her daughter and my father. She lived here when she made that doily. 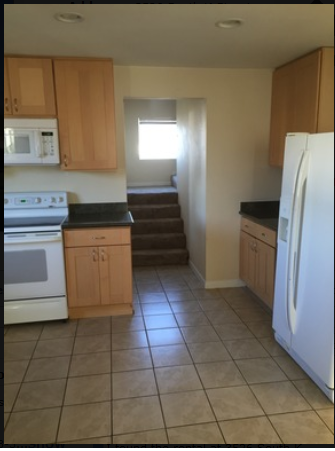 The house above right is a current view; the photo below is a current kitchen view. She sat here near the wood-burning stove to keep warm while writing her many, many letters. 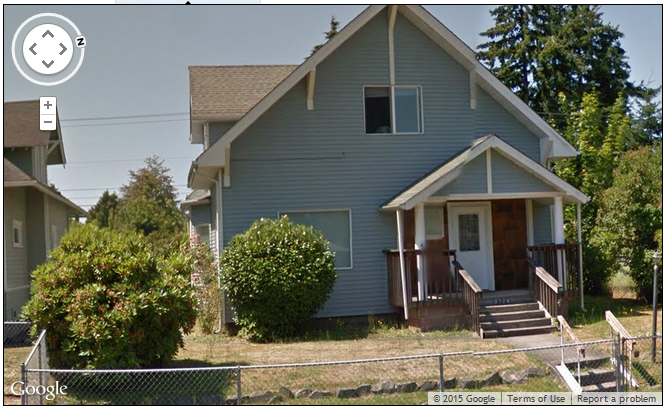 Since the house became a rental I was able to take a peek inside through various on-line real estate sites. The porch is changed, but this was their house. Orah may never have given me a thought, whether she would have great grandchildren, but I have thought about her, plenty. That gave me an idea. As of this writing, I have no grandchildren. 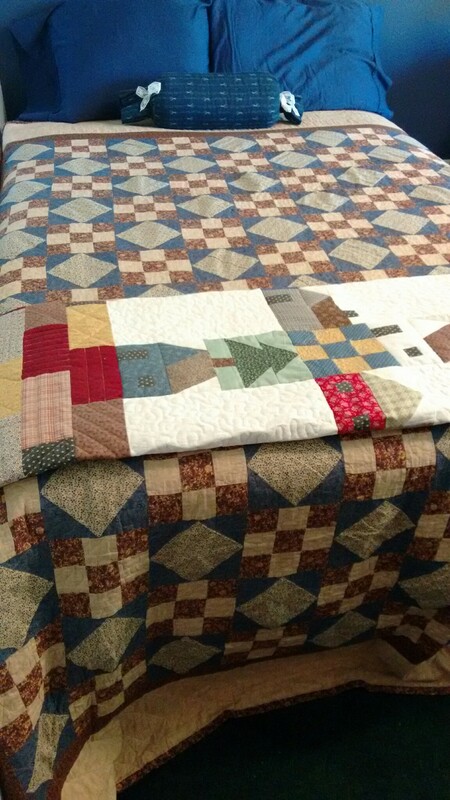 When I am long gone, though, there is something I’d love my grandchildren and their children to have: my quilts. There are big ones and small ones, and they are all over this house. Most were made when my three were in grade school. This was my therapy, my adult time, when the creative juices were flowing. One of my greatest wishes is for my grandchildren (and their children) to know they are often thought of, and how saddened I am to think that, likely, I will never meet my great grandchildren. How I wish I could be a presence in their lives. Maybe connection occurs through the passing of possessions, items we use daily, some we take for granted. Maybe continuity arises from a mere glance, seeing an object made long ago. From Orah to dad to Lalla to me and beyond, there is continuity, and the connection lives. I understand that right now, heirlooms are mere objects to my children. I get it. I can also say, with a fair amount of certainty, that one day, one day far, far away, objects will become heirlooms, and they will matter. Meantime, class is in session. (1) Belk, R.W. (1990). “The Role of Possessions in Constructing and Maintaining a Sense of Past”, in NA – Advances in Consumer Research Volume 17, eds. Marvin E. Goldberg, Gerald Gorn, and Richard W. Pollay, Provo, UT : Association for Consumer Research, Pages: 669-676. (http://www.acrwebsite.org/search/view-conference-proceedings.aspx?Id=7083). Reflection: Do you own irreplaceable heirlooms? What makes them meaningful? Is it possible to cherish an item owned or created by someone you did not know (or respect)? Does continuity enter your thought processes when you think of heirlooms? I’ve tried to find information on my paternal grandfather but no luck. I’ve used Ancestry.com, but have not purchased a membership, yet. I probably will later. Have you tried that one? I love that wobbly table. How utterly charming. Makes one feel that its prior owner must be nearby. 😉 Have you considered writing a book about the story you told me above? Sounds like book-worthy material.